WPEngine is a managed hosting company specifically designed for WordPress users. By every means WPEngine was quite dominant when it came to impressing users with its custom dashboard, easy management, high-speed servers and more. Ever since their company started to grow, their services started to deteriorate for their beginner user base. Review from Matthew Woodward & This case of Harsh Agrawal proves that they were playing with their customers. There are many more reasons than their high industry level pricing for you to not to choose WPEngine as your new or next host and we will be discussing them in this post as well. Keep them for your business uses as they are more powerful when it comes to industry level hosting solutions for WordPress users. 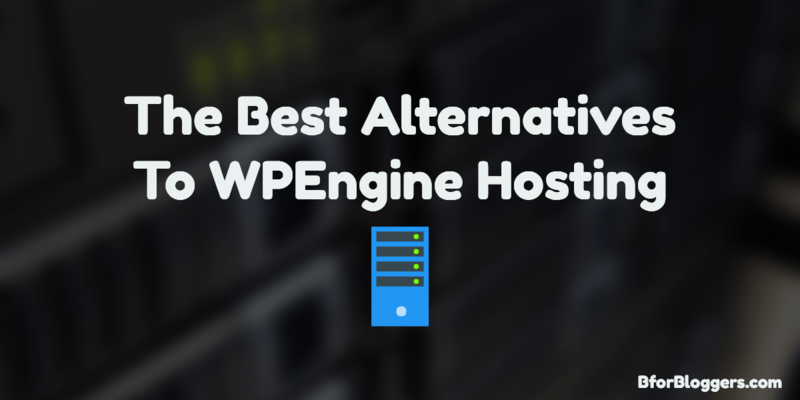 So, In this post, I will be discussing about 2 web hosting companies who are absolutely perfect to be called a “WPEngine Alternative”. Keep in mind that I have been with both of them, so there is no chance of any biased opinion. Below listed are 2 best and cheapest WPEngine alternative. Nestify is where I host BforBloggers. Nestify is a premium managed hosting company I found when I was looking for a managed to host that accepted payments on a monthly basis with no hidden fees. Nestify can be a very cheap and effective alternative to WPEngine due to its price being less than $7.99 a month. Other than its managed shared servers, Nestify also offers VPS and recently they have also included cloud hosting plans on the pay as you go payment basis. Just like WPEngine, Nestify too has a custom cache solution which ensures your site is blazing fast. Daily off-site backups, CDN, and protection services are given for free as well. Unlike WPEngine, Nestify doesn’t include any overage charges if you cross your traffic limits. When compared to WPEngine’s plugin policy, Nestify has no restrictions on what plugin you can use on your WordPress site. Moreover, they offer free migrations, 24×7 support, and plugin troubleshoot as well. I’m very satisfied with their services so overall, I highly recommend Nestify over WPEngine. Host On Nestify or read the Nestify review. Flywheel is another magical hosting company, not so cheap but high on performance. If you’ll look on to my Flywheel hosting review, You will see that when I compared it to others I pointed Flywheel to be on the expensive side. When you compare the plans of WPEngine with Flywheel, you will see the price at Flywheel starts at $14/month. Flywheel is not a cheap alternative to WPEngine, Instead, it is a powerful option to choose from if you are unhappy with WPengine and its services. Flywheel support team is highly skilled, friendly and prompt. With more power over your servers and best in the class features, I recommend flywheel for anyone who’s looking for a powerful host other than WPEngine. For a rather cheap and shared hosting solution, Siteground managed WordPress hosting might be the best for you. Apart from that, you may also want to use Dreampress if you prefer paying monthly. If you want the same power of WPEngine, you may want to use WPX hosting. This is where I host BforBloggers. You can read WPX hosting’s review here. Share your favorite WordPress host in the comments section below.